A comprehensive commentary on employee taxation including legislation. The print subscription includes a free mobile version as well as updates for 12 months (print and mobile). This work covers every aspect of the taxation of employees. It assists the employer and employee to understand the tax consequences of particular package choices and so structure tax-effective remuneration packages. It deals with inter alia: fringe benefits, share incentive schemes, retirement funding choices and medical cover, deferred compensation and other special payments, cross-border tax issues for incoming and outgoing expat employees. Recent developments are provided after the annual Budget Speech and extensive legislative materials, such as extracts from Acts, Interpretation and Practice Notes and SARS Guides, are added for ease of use. Updated on a regular basis to keep current with changes in legislation and case law. 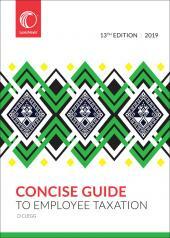 All subs get a complimentary copy of LexisNexis Concise Guide to Employee Taxation at the beginning of each year.